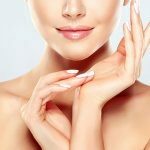 Earlier this year, researchers at Stanford University identified genes connected to rosacea. Maybe this knowledge will help create better treatments for those with this skin condition. In the meantime, there are simple, inexpensive natural remedies to help heal and reduce the dry skin, itchiness, and redness of rosacea. Immune response to a bacteria. Those with acne rosacea often experience a heightened immune reaction to Bacillus oleronius. Helicobacter pylori (H. pylori) is a type of bacteria that can live in your digestive tract. Many people with rosacea also have an H. pylori infection. A mite that lives on the nose and cheeks of every human, Demodex, occurs in large numbers on the face of people with rosacea. A skin protein that protects from infection may cause redness and swelling in some people. This type of rosacea appears as constant flushing and redness in the cheeks and nose with blood vessels often visible. 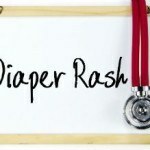 Dry, itchy skin and roughness may also appear. It’s officially called Erythematotelangiectatic rosacea. Breakouts, like acne, with bumps or actual pimples appear with this type of rosacea. Some people even develop raised patches of skin called plaques. This type is called Papulopustular rosacea. In some cases, the skin of the nose thickens and becomes bumpy, irregular, and swollen. Like the other forms of rosacea, the skin is also red. This condition is also known as Phymatous rosacea. As it sounds, this condition afflicts the eyes. They may appear red and irritated or bloodshot or watery. The eyelids may swell. Styes are common in those who suffer from eye irritation caused by rosacea. Your diet plays an important role in your health. Some foods and germs (like H. pylori) can trigger immune system reactions in your gut that can make conditions like rosacea worse. To keep your gut healthy, eat probiotics like yogurt and kefir regularly. They keep harmful organisms like H. pylori under control and aid digestion to prevent foods from causing irritation. Food’s not the only way to trigger rosacea. Many patients claim alcohol triggers their symptoms. When it comes to skincare products, avoid makeup and lotions with fragrance or perfume, menthol, peppermint, eucalyptus, and witch hazel. Stress and anxiety also trigger the immune system to respond and can make symptoms appear or current symptoms worse. Heat, sun, winds, and humidity may also make this skin condition appear. You can buy an Aloe vera gel or use aloe vera fresh from the leaf of an aloe vera plant. To use fresh, pluck a leaf from an aloe vera plant, break it open, and lightly massage the juice on your face. Once it dries, rinse with lukewarm water. With anti-inflammatory and antioxidant properties, oatmeal moisturizes and delivers nutrients that help calm the redness and itchiness of rosacea. Mix oatmeal with half that amount of water and spread over the face and irritated skin. Leave it on for 15-20 minutes and rinse with cool water. Dry your skin gently. Soak a facial towel in green tea and place it on your face for 20-30 minutes. Its nutrients cleanse, calm, and soothe your skin. Raw honey is a sweet treat that makes an excellent skin treatment. It protects against germs, acne, and dryness. Simply rub one or two tablespoons of raw honey – it must be raw – on your face for 10 minutes and rinse with warm water. Do this a couple times a week. Mix turmeric powder or crushed fresh turmeric with plain yogurt. Apply and leave the mixture on for 15 minutes. Then rinse with warm water. Do this daily to get the most from turmeric’s antioxidant and cleansing effect. 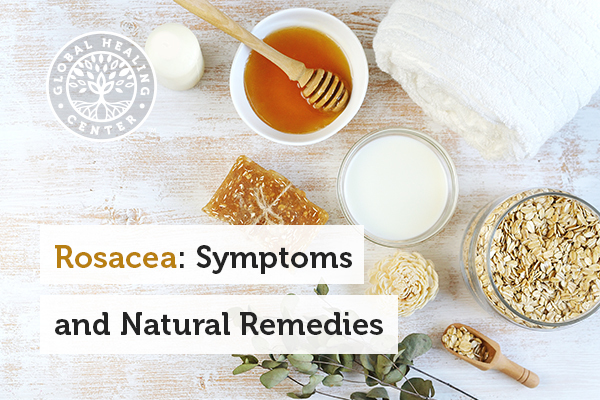 You can find other natural home remedies to treat rosacea. I personally recommend a two-faceted approach. Soothe the irritated skin with Parfait Visage®. Also use a probiotic such as Floratrex™ to encourage healthy digestion, prevent bacterial infection, and reduce redness and swelling associated with immune system response. Stanford Medicine News Center. Genetic basis of rosacea identified by researchers. 2015 Mar 12. National Rosacea Center. What is Rosacea? Vemuri RC1, Gundamaraju R1, Sekaran SD1, Manikam R2. Major pathophysiological correlations of rosacea: a complete clinical appraisal. Int J Med Sci. 2015 May 5;12(5):387-96. doi: 10.7150/ijms.10608.